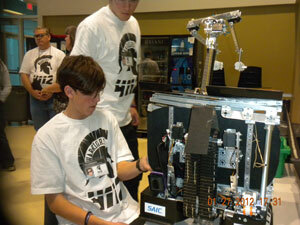 The Warriors impressed judges during hardware inspections and placed fourth at the end of their first-round matches. Shortly after, Rock Robotics picked South Carolina Team 311, also known as the Fembots, as their alliance partner. The Warrior's alliance proved to be an effective strategy because the Warriors and their alliance partner beat the number one seed in their division. The team moved on to division finals, and won there, moving on to the championship match. The Warriors and their alliance were ultimately defeated in the championship match but finished strong. During the end-of-competition award ceremony, the Warriors won the “Think Award,” for the third time this year because of their impressive engineering journal. They were also nominated for the Promote Award and the Compass Award. Their alliance partner, Team 311, ended up qualifying for the World Championships because they won second place Inspire Award. Although the Warriors did not move onto the World Championships, the team came away from this season with six awards and three award nominations. The team also won second place in two of the three Regional Championship tournaments they entered. For more information on FTC, please visit www.usfirst.org/ftc. Tournament videos available here: http://on.fb.me/zCt36b. The original article was written by Rock Academy High School Student, Avery Berchek.